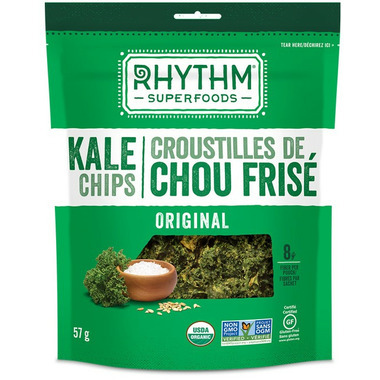 Rhythm Superfoods kale chips are made by tossing fresh, organic kale with one of their hand-crafted dressings, which they create from a perfect blend of organic seeds, vegetable powders, juices, herbs and spices. Their kale chips are never fried — instead, they are gently dehydrated under low heat. Ingredients: Kale, sunflower seeds, tahini (ground sesame seeds), carrot, apple cider vinegar, cane sugar, onion, *sea salt, lemon juice. *Represents a natural non-organic ingredient.